The Hospital of Central Connecticut is excited to be able to participate in the DAISY Foundation's recognition of nurses in this way. If you would like to nominate one of our nurses, please fill out the official nomination form below. I would like to nominate the following nurse at the Hospital of Central Connecticut as a deserving recipient of The DAISY Award. This nurse demonstrates compassionate care, commitment to excellence, extraordinary services and provides a remarkable patient experience. Nominations will roll over for consideration for one year. 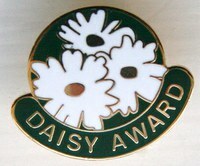 A DAISY Award recipient will be announced and celebrated quarterly.